Note: This is the first review and configure page where I give a score to the router. Keep in mind that as time progresses, possibilities will change as well. So relate the score to the date! Note: For those living in the Netherlands. I have seen this router for as low as 219 Euro's at Korving.nl - you can also call 076-5719298 for ordering info. Besides the very comfortable pricing, it's a very easy router to get installed. Between receiving the box and having it all up and running, took me about 5 minutes. Great! This was a new experience for me. I haven't seen such an easy installation before. Besides connecting the usual cable set, it was just a matter of following the "wizard" step-by-step. For Dutch users, some extra compliments to SMC: they included two separate documents for quick configuration for ADSL by KPN and by BBNed. A tip for other manufacturers out there, this is the way it should be! The built-in DHCP and standard settings enabled Internet access in no-time. Wireless LAN worked instantly with my D-Link PCMCIA card, on my laptop I only needed to set the proper SSID (networkname). The range of the SMC is even better than what I'm used to from my D-Link 713P. Another great surprise: MSN Messenger worked properly. In this case I'm happy to say that it DOES support MSN Voice and Video in it's standard config. In a nutshell: Not much left to wish with this baby. 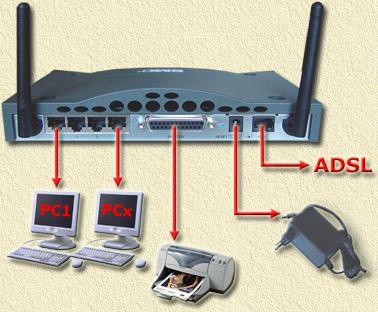 Very complete router, with built in WiFi, Printer server, DHCP, NAT, Firewall, ADSL modem, etc. Very easy to configure. A must have for ADSL users. ·"ALWAYS ON" support, MAC address cloning, real Firewall. ·11 Mbps for WiFi is a bit outdated. ·Commando's in the web interface can sometimes trigger download managers. Router/Switch The router functionality is very complete, includes NAT and a real Firewall. Naturally, features like DNS and DHCP are in place as well. Suitable for MSN Video and Voice! 4 ports, 10/100 Mbps network connection. Printer server This router comes with a built in printer server. This allows you to share a printer over the network (connect the printer to the parallel port of the router) without the need of having a PC running to handle the sharing. Wireless LAN WiFi on this router is a 11 Mbps 802.11b, compatible with most WiFi hardware out there, supporting 64 bit and 128 bit WEP and MAC address filtering. 11 Mbps is not quite on-par with the current state of technology, but more than sufficient for Internet access. Always fun to take a peek in the box, so what's in there? In my case, I got the ISDN version (WBRB). Most ADSL modems seem to have issues with DSLAM's (the Tel Co connection) used by for example KPN since they use old crap from Cisco and Nokia. The DLSAM's used by BBNed usually do not oppose a problem. This SMC model works fine with both of them! 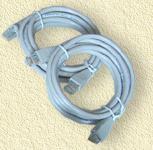 Two cables, both identical (UTP) and can be used either for the ADSL connection or as a regular network cable. Note that ADSL by KPN uses a smaller RJ-11 connector (6 pins, as seen with POTS/Analog phones). SMC informed me that the little RJ11 connector can be inserted into the larger RJ-45 connector of the modem without any problems. Not a very elegant way to do it, but it works. Also included, a CD Rom with the manual as a PDF file, and two dutch leaflets (in full color) for KPN and BBNed settings. This might differ per country. Note for the 7404WBRB (the ISDN version): A little surprise was the fact that for my ADSL connection (KPN) I had a RJ-11 connector, where as the modem has an RJ-45 socket. Hmmm,... SMC informed me that I can insert the RJ-11 into the RJ-45 without any problem ... to my surprise, it does indeed work. This does not seem to be the case with the POTS/Analog version, where a regular RJ-11 connector can be found. A 4 LAN connections - here you connect your PC's and/or switch/hub. B Printer port for the printer server. Connect you printer here. C Reset button - this reset's the router. Holding it for 5 seconds or more, will reset the modem to factory settings. D Power supply - here we connect the power supply. E ADSL connection - The ADSL cable (directly from the Tel Co or from after a splitter) comes here. If you are already using a modem (an Alcatel for example) unplug it completely. Now take the ADSL connector and plug it into the SMC router. The best way to begin, is by connecting only one PC to the SMC (just checking if everything works OK). Connect the network cable of that PC to one of the 4 LAN ports. Configure the TCP/IP network settings of you PC, so it will take DHCP. Visit these pages to find out how: Windows 95/98/ME, Windows 2000/XP, Apple Macintosh OS 7/8 and Apple Macintosh OS X. Linux users most likely do know how to enable DHCP for their PC's. Tip: In case you are using a proxy, DISABLE it NOW! Note: Users of Windows 95, 98 and ME: You should shutdown your PC now. Connect the parallel cable of your printer to the SMC. !! This is optional, you can always do it later if you want to !! Connect the supplied power supply to the SMC and the power outlet. Note: Windows 95, 98 and ME user: Switch you PC ON again. A PWR - If on, the power supply is OK and the router is ON. B SYN - Indicates the ADSL connectivity. Blinking means that it's searching for an ADSL connection. If this light is ON all the time, than this means that the ADSL connection is successful. If this light is OFF, then either ADSL is not connected or you're experiencing some other problem why there is no ADSL connection. C DATA - Blinking means data transfer over the ADSL connection. D WLAN - This light indicates data transfer for Wireless LAN. Only data transfer! So it does not show you if anyone is connected! E 1 to 4 - These lights indicate that a PC or other network device has been connected to that particular port. Blinking means active data transfer, and OFF means nothing connected (or wrong cable used). If you followed the steps above, then first the PWR will light up, quickly followed by the LAN port light on which you connected your PC. The light SYN will, if you connected ADSL properly, first start blinking and after a short will stay ON. If this is NOT the case: check the connections and the cables you used. 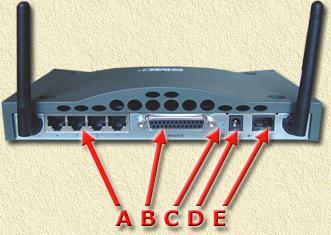 Configuration of the router, as displayed below, is focusing on MXStream (ADSL provider by KPN). BBNed users (also Dutch) will see a reference in the text to BBNed specific settings. If you already had an (A)DSL modem installed that uses a dialup adapter, then please remove it to avoid confusion! You can optionally disable this dialup connection, however, we do recommend REMOVING the dialup connection(s). Use Internet Explorer to disable the dialup connections. Go to TOOLS -> INTERNET OPTIONS -> CONNECTIONS. Check the option "Never dial a connection" and click "OK". Before we continue a tip: Disable all download managers (like FlashGet, GetRight, etc). Commands executed on the router use the EXE extension, which triggers download managers. In my situation, I had FlashGet running. Showing this popup each time an EXE has to be executed. In case this happens to you, either fully disable the download manager or click "Cancel" in the popup. Let's first check if DHCP did what it is supposed to do. Your PC should have gotten an IP-Address in the 192.168.2.100 ... 192.168.2.199 range. On Windows PC's you can open a DOS box and type the command IPCONFIG, which will show your assigned IP-address. If this is NOT the case, then please REBOOT your PC. Start a web browser, for example Internet Explorer, Opera or Netscape. Type in the address-field of the browser, this address: http://192.168.2.1 and press ENTER. There is no password by default, so you do not need to enter one. Step 3: Go to "Setup Wizard"
Note: BBNed will do NO SUCH THING. See the BBNed specific setting at the bottom of this page. The SMC router would now like you to do some time settings. Optionally you can skip this! First set your time-zone at the "Set Time Zone" field. Residents of Holland, Germany, and Belgium choose "(GMT+01:00) Amsterdam, Berlin,...". You can also use an NTP server. An NTP server is basically an Internet service allowing to keep your clock in sync with some kind of atomic clock. Check the option "Enable Automatic Time Server Maintenance". For Europeans: choose for "Primary Server" the server "129.132.2.21-Europe", and for "Secondary Server" the server "130.149.17.8-Europe". These values can be selected from the dropdownlist. Now click "Next" (lower right corner). On the page "Internet Sharing" (not entirely the right choice of words) we need to set the type of connection. Select "PPPoA(Routing Mode, for multiple PCs)" and click "Next" (lower right corner). On this page we need to enter the login data we got from our Internet Provider (ISP). Enter "Username" (some provider require an "@...." text!) and "Password" (twice). Enter the primary DNS server's IP-addres. Check with the documentation you received from your ISP or take a look at our DNS List. The VPI/VCI for all KPN based connections (in the Netherlands) is: 8 / 48 (as show above). Note: Belgian providers often use: 8 / 35. The router will now reboot. The SYN light will blink briefly and then remains ON - you're online now. Before do our first Test-Drive, we want to check the status. Again use a browser and visit http://192.168.2.1 (if you have closed the browser) and login again by clicking the "LOGIN" button. Now we select the option "Advanced Setup". In the navigation bar (on the left) choose "STATUS". A new screen appears showing your current status. In case you DO NOT see this (ADSL: CONNECTED), your connection is NOT OK. First try what happens when clicking the "Connect" button! First check if the SYN is ON. If not: Check the ADSL cable! Next check "WAN" - "ATM" (also in the navigation bar on the left) and verify your ISP settings. One of the cool features of the SMC 7404 WBRA (or WBRB) is the built in printer server. Note: you do not need a special printer driver for this! Connect the printer (parallel-port) to the router if you haven't done so. Note: Repeat the steps below on all involved PC's. In Windows we will now add a new printer. Open "Control Panel" - "Printers" and choose "Add new printer". The "Add Printer Wizard" will now open. Click "Next". In the window "Local or Network Printer" select the option "Local printer attached to this computer" and click "Next". SMC7404 WBRAB - Select "LOCAL" printer! In the next window we must choose a printer port. We will create a new port here! Check "Create a new port" and select the type "Standard TCP/IP Port". Click "Next" again. And again, yet another wizard is being started, in this case the "Add standard TCP/IP Port Wizard". Click "Next". In the next window you ONLY enter data into the "Printer Name or IP Address" field. Enter the value 192.168.2.1 (the IP-address of the SMC router). The second field, "Port Name", will be completed automatically by Windows. Again, click "Next". The next window, "Additional Port Information Required", requires you to enter some specific settings. Choose "Custom" and click "Settings...". Check "LPR" and enter "LPT1" at the "Queue Name:" field. Check "LPR" and complete the "Queue Name"
Now click "OK". Click "Next". A brief summary of the created port will be displayed now, click "Finish". Now windows could ask you to "Keep existing driver", this happens when you already had a printer of this brand/model on your PC. It's OK to keep the existing one. Click "Next". In the next window you can give the printer a specific name. Windows already offers a suggestion. I usually complete this name by adding "(network)", this way I can see later on that this is a network printer. You can also check "Default Printer", if you want this to be your default printer. Click "Next". In the next window, Windows would like to know if you want to share this printer. Check "Do not share" - the sharing is already being delt with by the SMC, so we do not need Windows to share it again. Click "Next". Finally, windows asks you if you would like to print a test page. It is not required but I would do so anyway,... just to make sure it works. Click "Next". Windows now shows you an overview of the added printer. Click "Finish". Windows will now copy some files and start printing the test page, if you checked "Print test page". The printer is nw installed. The SMC default settings are pretty OK, but we can always do some fine-tuning. Use the browser to go to http://192.168.2.1 and click "LOGIN". Go to "Advanced Setup". From the navigation bar on the left, choose "System" - "Password Settings". Do not enter anything in the "Current Password" - since there is no password by default. At the fields "New Password" and "Re-Enter Password for Verification" you can enter a new password - WRITE IT DOWN!!!! Set a password to restrict management access to the Barricade. If you want to manage the Barricade from a remote location (outside of the local network), you must also specify the IP address of the remote PC. You can do this in the Firewall - Access Control menu. So now, nobody will be able (almost) to change settings in the router without the password. Note: WRITE DOWN THE PASSWORD! A password limits access to the router, but how about those sick puppies out there that feel the need to hack into your network? Note: real hackers do most likely not try to "attack" your network. Usually only "wannabe's" try to access a home network ... using other people's tricks,.. so they are no real hackers. To limit their access to your network, we can enable the built in firewall of the SMC7404WBRA/B. Again go to http://192.168.2.1, click "LOGIN" and click "Advanced Setup". From the navigation on the left choose "Firewall". On the right check "Enable", and click "APPLY". The firewall is up and running. For details on protecting Wireless LAN, please read this page. In particular the part about protecting your network. For those of you that have somekind of server running (for example Web or FTP), should consider enabling the "Always ON" feature (as of firmware 0.24). Click "WAN" - "ATM" and enable "Always ON". THIS PART IS ONLY FOR BBNED USERS! After login, select "Advanced Setup". In the navigation bar on the left, choose "WAN". Below "WAN" some options appear. Choose "ATM". Click "Apply". The router reboots. The SYN light will blink shortly and the stay ON, you're online now. Please continue reading HERE.